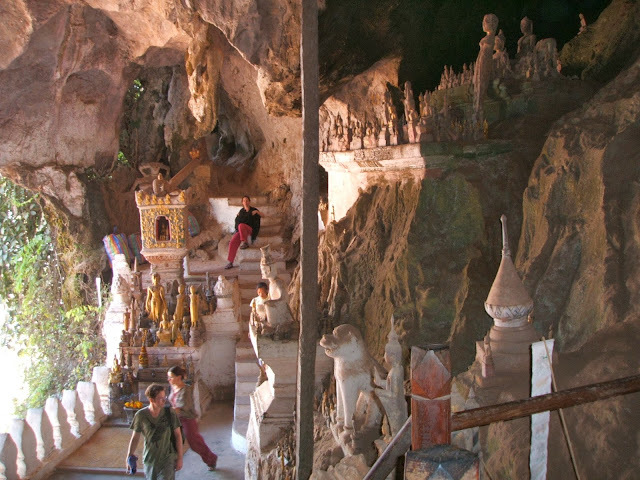 This is Part II of a post on the magical town of Luang Prabang in Laos. For Part I, visit here. Luang Prabang is a beautifully preserved, UNESCO World Heritage town located between two rivers in the northern part of Laos. Surrounded by densely-forested mountains, Luang Prabang lies on a peninsula at the confluence of the Mekong and Nam Khan rivers. The former royal capital is steeped in history, with over 30 Buddhist temples amongst French colonial architecture that remains relatively unchanged. It is a peaceful, elegant and culturally rich city with a laid back, cosmopolitan community and a distinctive old world charm. Unlike the fast-paced hustle and bustle of neighbouring Asian cities, the pace of life in Luang Prabang is slow and hypnotic, reflecting the tranquil landscape that surrounds it. Beyond the 5 star splendour of La Residence Phou Vao (my favourite choice for those looking to splurge and reviewed in Part I here), My Dream Boutique Resort is a very good budget option without compromising on quality or style. 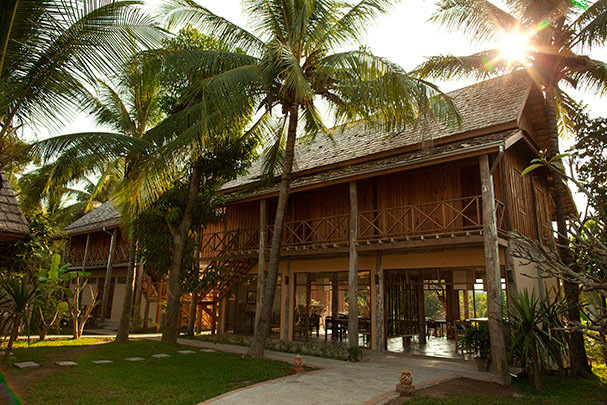 This is a charming hotel, with Laos-style houses on stilts, natural wood flooring, sandy coloured walls and exposed distressed wooden beams. I loved the simple but elegant Laotian decor of the rooms, and open-air restaurant. Prices range from around £30 to £60 per night depending on room type and season, which I thought was great value for accommodation of this calibre. During the week I was there, my room cost an average of £35 per night, and had a private balcony with lovely views to the swimming pool and the Nam Khan river. My room was spacious and tastefully furnished, with complimentary WiFi and bottled water. The hotel is located a 15 minute walk from the town centre, on the opposite side of Nam Khan river. The hotel offers free bike loans to residents, which reduces the journey time to 5 minutes. Cycling is by far the best way to get around town, so this is an added bonus by saving the need to hire a bike elsewhere. The swimming pool is of good size, and is surrounded by pristine tropical gardens that run down to the banks of the Nam Khan river. The hotel’s restaurant, where breakfast is taken, overlooks the swimming pool. It’s a lovely setting for breakfast, other meals or just a chilled Lao beer. Breakfast was varied, with cereals, freshly squeezed juices and yoghurt, as well as crusty French bread, good croissants, and eggs cooked to order. If I could improve the selection, I would have added some Laotian breakfast dishes to the hot cooked options on offer. The coffee was however very good, and the freshly cut tropical fruit were ripe and beautifully sweet, both the highlights of my breakfast each morning. During the week I was there, I got to chat and make friends with most staff including the owner, Mr Somnuek, who even took us to one of his favourite Laotian barbecue restaurants where we all enjoyed a wonderful dinner (Dr G and I were the only foreigners in sight). He also recommended the best and least known Lao massage place in town (reviewed in Part I) which was a great find. The service, comfort and style of the hotel and the lovely setting made for a memorable stay, and I would highly recommend My Dream Boutique Resort to anyone heading to Luang Prabang. For an explanation of Laotian cuisine and reviews of other restaurants in Luang Prabang including L’Elephant, Le Patio Cafe, 3 Nagas, and Le Tangor, please go to Part I of this post here. Tamarind is a brightly decorated and charming restaurant facing the Nam Kham River; it is also famous for its Laotian cookery classes, which I took during my stay (see What to Do section below). I enjoyed the food at Tamarind and dined there 3 times over the two-week period I was visiting the town. Due to the restaurant being also a cooking school, there is a real emphasis on educating diners about the intricacies of Laotian cuisine, eating habits and diet, as well as an explanation by waiting staff on the various ingredients that go into each dish being served. I devoured every bit of information given to me as much as I did their delicious food. I also enjoyed the vegetarian version of laap, Tofu Laap (£2.50), made from thinly sliced deep fried tofu, bean sprouts, shallots, coriander, mint, basil and fish leaf. I am always on the look out for different tofu dishes and this was certainly one that I would like to experiment with at home. Cafe Ban Vat Sene is part of a group of 4 upmarket restaurants in town - L’Elephant and Le Patio Cafe which I reviewed in Part I (see review here), and also Coconut Garden which I review below. This is a smart cafe on Luang Prabang’s main road (Sakkarine Road), and a good place for a chilled beer and a snack, and like most cafes in town, it also offers free WiFi. I visited Cafe Ban Vat Sene a few times whilst in Luang Prabang but only ate there once. The menu is mainly French with various breakfast options as well as some light Western dishes like pasta and burgers. There is also a limited but well thought out list of Asian dishes on offer. I tried their “Fer” (£2.30), a Laotian take on the Vietnamese national dish - Pho. As in Vietnam, the soup was made from thin slices of beef, rice noodles and many different herbs in a clear but highly concentrated broth. It also had a few slices of fresh tomatoes which I felt was a nice addition. The fer was delicious and very refreshing. We were taken to Malee Lao Food Restaurant by Mr Somnuek, the owner of My Dream Boutique Resort, this is one of his favourite local restaurants. The specialty here is Laotian BBQ cooked on a portable hat-shaped metal grill set over live coals at the table. An assortment of different meats (pork, chicken and fish) is cooked around the top part of the grill, the juices dripping down to the lower rim where vegetables were cooking in a flavoursome chicken stock. We were given a selection of mushrooms, noodles and local herbs to cook. To accompany it, we also had a jeow, a highly flavoured dipping condiment made of fermented soya bean and pork, which we mixed into the broth, or dipped the grilled meat into. Barbecuing over coals is the most traditional method of cooking in Lao, where conventional stoves or ovens are still rare. This method imparts a deliciously charred flavour to vegetables and meat. We had a few bottles of Beer Lao to accompany the meal, and it was a very sociable event since we all shared the same cooking dish from which to eat. Dr G and I were the only foreigners in the restaurant. The owner did understand some English though, so I would highly recommend this restaurant if you are in town. This is another very popular restaurant on Luang Prabang’s main road, with beautiful al fresco eating in the gardens at the front and back. I ate here twice, and on both occasions the food was very good. I enjoyed their set Lao Noy (£7), which included a Lao omelette made with dill and other local fresh herbs, grilled chicken breast marinated in garlic, and sautéed vegetables. There was also a jeow of tomato concasse and grilled chilli, which I had with sticky rice. I also liked their fried crispy coconut rice and sour pork salad (£3.20), and fried pork ribs marinated in garlic (£3.20). For other activities not listed below, including my recommendations for the best massages in Luang Prabang, temple visits, cycling and the Traditional Arts and Ethnology Centre, please visit Part I of this post here. The cookery classes at Tamarind are said to be the best in Luang Prabang. I was quick to sign up for one during my first week in town. Classes run from 9am to around 3pm, and start with a visit to Phousy market. I generally find these market visits rather gimmicky, but I must admit I found this visit of almost one hour very educational. In particular, it was good to see the many local fresh herbs in their raw state, some of which I had been eating for a few days without knowing what they looked like. Also we were taken to a vendor who sold Laotian snacks including thinly sliced, dried and seasoned bamboo shoots and also black mushrooms, both eaten like crisps. Following the visit, we then went to an open-air kitchen about 10 minutes outside the town centre, for the class itself. The group was varied, with two retired couples from Australia, a French university student, and a young Swiss couple. The teacher was a young Laotian man who trained as a vet and spoke good English, and from the way he conducted himself, it was clear that he was experienced in delivering the class. We learned how to make tomato and aubergine Jeows (dipping sauces), as well as the very popular Mok Pa (river water fish steamed in banana leaves), and lemongrass stalks stuffed with minced chicken, coriander and kaffir lime leaf. We also learned how to make buffalo laap - traditionally the meat is served raw, but we flash-fried it, and flavoured it with many herbs, toasted rice powder, buffalo tripe and bile for sourness, among many other ingredients. We were also shown how to prepare sticky rice using a wicker steamer in the traditional manner. For dessert, we prepared purple sticky rice with coconut sauce, served with a variety of fresh fruit. The class was quite hands-on, and a good way to spend a day, although having taught cooking classes myself for the last year, I could see a few areas for improvement. For example, the class felt rushed, and the teacher was at times impatient with the older learners. I also felt that the class lacked information on the background to Lao cooking, culture and ingredients, as opposed to simply teaching recipes. Another downside is that they repeat the same menu every day, so there is no opportunity to develop a deeper understanding of Lao cooking if you have a few days to spare. The food, however, was delicious, and I enjoyed sharing the meal with the other members at the end of the class. If you decide to take this class, I would recommend you ask the questions you want answered because sometimes information is not otherwise forthcoming. A small booklet is given out at the end, including all the recipes cooked in the class and a few others. There is also a selection of good Laotian cookery books at the Tamarind restaurant. There are a number of day trips outside Luang Prabang, which can be arranged either via your hotel or via one of the many agencies on the main road, Rue Sisavangvong. These include visits to some of the nearby ethnic villages, the 1000-Buddha Cave. A visit to the the Plain of Jars would require an overnight stay. One of the most interesting trips we did was to visit two of the ethnic villages near Luang Prabang where we had the opportunity to visit some local people and be invited into their homes for tea. Considering that the people had so little, and lived without running water or electricity, it was very humbling to receive their hospitality. 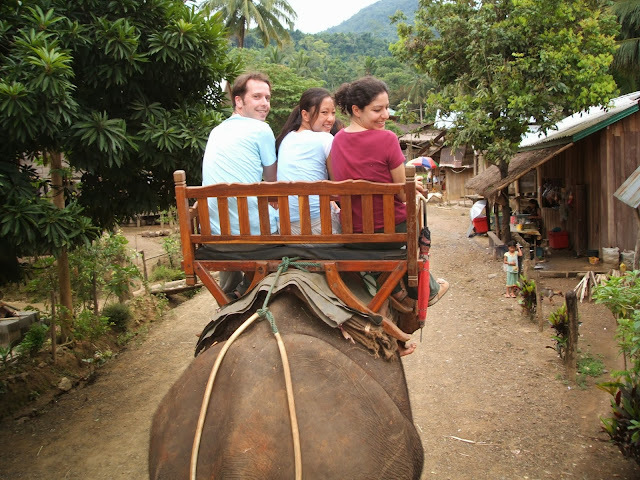 Elephant trekking however was for us a waste of time, money and elephants. The animals looked tired of carrying tourists on their back all day long, and we felt rather guilty as we left - never to be repeated (by us). This is a Buddhist ceremony by which locals donate sticky rice and other foods to the monks on the streets of Luang Prabang. It takes place at dawn, and at best is a time-honoured, charitable and dignified event. Lately, it has attracted a lot of poorly behaved visitors who buy unsuitable and unhygienic food to donate to the monks, disturb them with flash photography and boorish behaviour, and some consider that it has become a tourist circus. We enjoyed the ceremony on our first visit eight years ago, and I would recommend a visit if you happen to arrive in town while still struggling with jet-lag - a 5am start will not seem so bad. The Royal Palace was built in 1904 during the French colonial era for King Sisavang Vong. After his death, Crown Prince Savang Vatthana and his family were the last to occupy the palace when, in 1975, the monarchy was overthrown by the communists and the royal family were taken to re-education camps. The palace was then converted into a national museum. The royal apartments have been faithfully preserved, and offer a fascinating glimpse into the lifestyle of the king and his family. The exhibits include royal religious objects, weapons, statues, screens, paintings from centuries past, and the crown jewels. There is also a 2,000 year-old, 83-centimetre Prabang Buddha, made from solid gold. Definitely worth a visit. 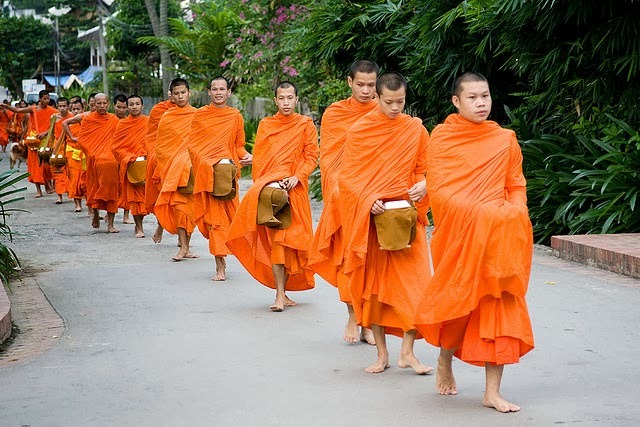 This is a serious activity in Luang Prabang, and there are many good locations for it. By far the best though was at the top of Mount Phousy. There is a £1.75 entrance fee and hundreds of steps to reach the top. There is a golden stupa at the top of the mountain, and a Buddhist temple with spectacular 360 degree views of Luang Prabang. The only downside is that it can get very crowded. Another good, much less energy-sapping location, is at one of the many bars along the Mekong or Nan Khan rivers. Enjoy the sunset while sipping a chilled Lao Beer, but don’t forget your mosquito repellent. 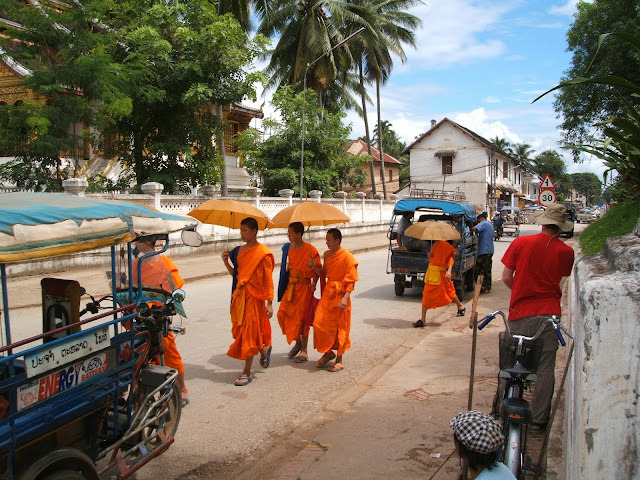 Hi Luiz - how many days would you recommend spending in Luang Prabang? I'm thinking of going there for 5 days (alone) and worried it might be too much?